We’d love your help. Let us know what’s wrong with this preview of Uncle John's Funniest Ever Bathroom Reader by Bathroom Readers' Institute. Dumb crooks: The robber who ran face-first into a wall because he forgot to poke eye holes in his pillow case. Witty wordplay: If Snoop Doggy Dogg were to marry Winnie the Pooh, his name would become Snoop Doggy Dogg Pooh. To ask other readers questions about Uncle John's Funniest Ever Bathroom Reader, please sign up. I really like this book. its good for a laugh when I just have a few minutes now and then. I received this book through the GoodReads First Reads giveaway program. 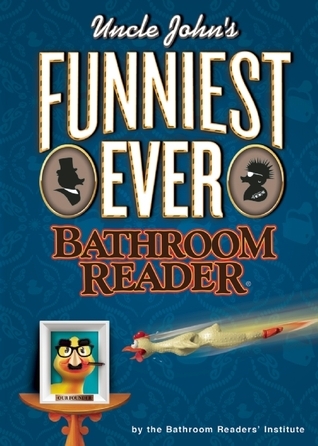 This is a collection of 1-2 page stories that are considered the best of the Bathroom Reader books. This book was really funny. It is filled with short stories, fun facts, and quotations. It is an enjoyable read whether you are in the bathroom or not. Always a good read!! These books are normally written with great humour, so, due to its title, I expected this one to be funnier than usual, but it wasn't. As always very entertaining. I too wonder what "fish ice" is. LoL.